People spend a lot of their time and energy on the treat part of trick-or-treating. We as a country aren’t doing a very good job of upholding the trick part. This list is full of pranks that you can pull on your unsuspecting friends. If you give them a treat after you scare them, they’ll probably forgive you. Keep reading to learn how you can send your whole office into a state of panic, and how you can make it look like your dog has eaten you. Imagine biting into a delicious chocolate bonbon (who calls them bonbons anymore?) only to discover that you’ve actually just eaten a chocolate covered Brussels sprout? 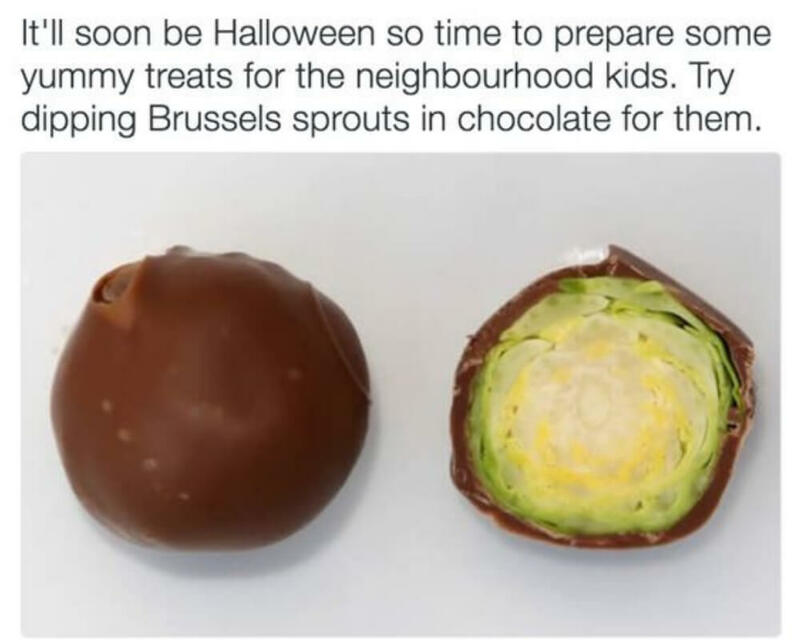 I actually love Brussels sprouts, and I love chocolate, but I don’t love those two foods together. I guess this is one way to get your kids to eat their vegetables.